A patented, handy device to agitate excess wax or polish out of the pad and reshape uneven foam pads so you can continue to use them. Directions: Keep the pad (attached onto a rotary buffer) facing the sky on a stable surface. The Duospur has three wheels with raised "teeth". As the pad spins when the rotary buffer is powered, roll the Duo-Spur over the pad and it will agitate excess product out. 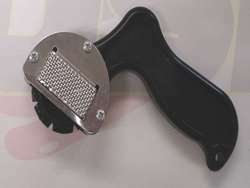 On the sides, the Duospur also has abrasive plates. Use these to level and reshape pads that have become uneven. Just hold the plate, which looks like a cheese grater, against the pad where it needs to be leveled, power on the rotary buffer and abrade away the uneven foam surface.